While everyone moves at their own pace, here are some signs that you can use to determine if it is time to own your own home. Let’s take a look at some of the reasons you can use to justify your decision. Those who have a steady job and know that they have a stable salary may want to make the move to homeownership. As long as there aren’t any other major debts eating into your income, you can probably handle a mortgage and other costs associated with homeownership. The equity that you build in your home can help you build wealth for the future if and when you want to retire. Your home may also make a great rental property in the future, which can help you diversify your portfolio and keep you solvent for years to come. 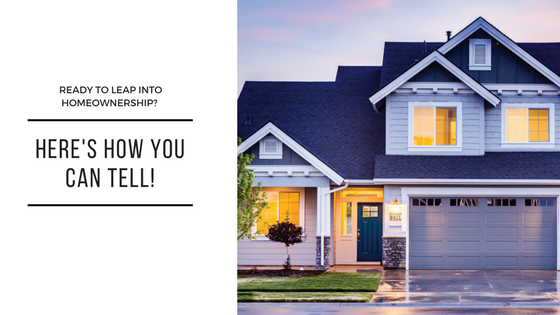 Are you ready to be a homeowner in the near future? Only you can say for sure if it is time to make that leap. However, those who are looking for a long-term housing solution may be ready to make that move. For more information, it may be worthwhile to talk to a licensed mortgage banker Today! Previous: Previous post: Have You Outgrown Your Current Home?